Grace In La – Fleur de lis sequins and leather skinny jeans. Stunning dark wash embellished skinny jeans. Featuring white leather, silver sequins and crystal embellishment on back and front pockets. Silver stitching throughout. These jeans run on the smaller side, so please choose a size larger than your normal size. 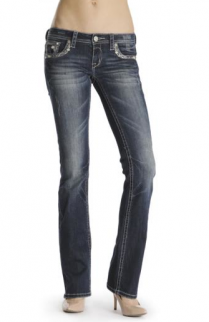 Please note the image shown is bootcut but we only have these in skinny.